Brexit makes the bulk of the headlines on Wednesday after MPs gave their backing to proposals to replace the controversial backstop. Brexit is front and centre for many of Tuesday’s papers ahead of crunch Brexit votes on Tuesday night. 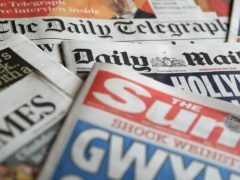 A variety of stories make the headlines on Monday, from the latest on the Brexit debate ahead of this week’s vote to the closure of magistrates courts.